I have never seen this label before and was intrigued. 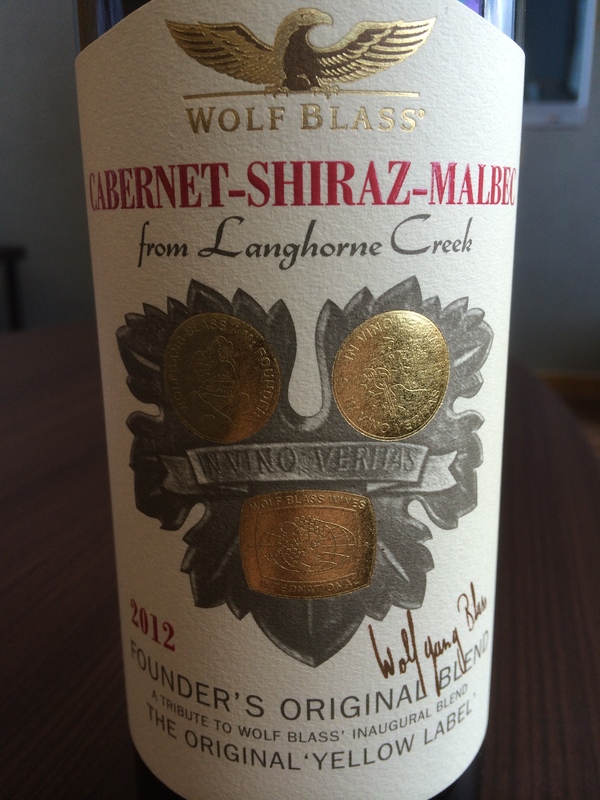 From Langhorne Creek this was the ‘original Yellow Label’ wine from Wolf(gang) Blass. A retro offering showcasing the winery’s heritage I guess. Nowadays, the blends from them are bottled in the Red Label series, the yellow being used for single varietals. Nonethless, it was an interesting amalgamation of three varietals. When I poured the wine, it was nearly blackish purple, appropriate for the grapes used. It had a nose of candied plums and strawberry twizzlers. My first impression was ‘tinny’. A metallic note hit me the wrong way and I was initially put off by it. I got black currants and plum torte after that and as the wine mellowed out, the tinny component gave way to a minerality that was quite pleasing. Good acidity and moderate tannins made this an easy to drink aperitif. I would give it a maximum of 4 years in the cellar and pair it with pasta and red sauce, perhaps BBQ ribs or a big juicy burger. I’m giving 87 points and 3 stars for this interesting $14 effort. Salut….